NOBLESVILLE, Ind. 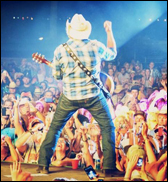 (CelebrityAccess) — Some country music are taking exception with a recent concert by country star Toby Keith and are claiming that the performer appeared to be visibly intoxicated during the performance. Multiple fans took to Twitter after Keith performed at the Klipsch Music Center on Sept 13th, to complain that Keith was slurring his words and seemingly forgetting lyrics. "So Toby Keith was terrible…he was so drunk u couldn't understand the words.." CaSEy RoTE Tweeted. "@TobyKeithMusic I am so mad!! Toby Keith was so drunk! he could not even get through all of the songs! I will NEVER again pay to see him!" a user named April tweeted. In a video taken during the concert, Keith can be heard slurring lyrics to his hit “Courtesy of the Red, White, & Blue,” before trailing off into an inaudible mumble.